"This is not a drink." This card said to me when I first used it, "This is a moment. The moment where you put the future in your hands, when stop doing nothing, and take control. You've only been half alive until now, nothing in your mind but apathy, lethargy and fog. Now comes the fire. Now you come alive. As that cool, carbonated liquid (with a hint of benzene) touches your lips and flows - nay, courses - through you, it's as if the dormant engine within you has ignited into life. That almost guilty shudder isn't a heart attack*, it's you casting off the dust and apathy from your life. (*it might actually be a heart attack. Drink responsibly). Now feeling rushes into your limbs, your fingertips buzz with creativity and your mind reaches into the infinite for the next move, your next move. You are imbued with the light of imagination. You can do anything. You can go anywhere. Your life is YOURS, you've just never realised it until now. This drink was but the fuel to get you started. So, newly awakened one, what wonders shall your mind envision? What 3 miracles shall you perform today?" "Ahm...How about two more wind-up robots and an internet connection?" I then learned the importance of proper shuffling. Energy-drink fueled visions aside this is a great card for any faction. You won't get the precision of something like a Special Order or similar 'tutor' card, but you will skim through a fifth of a standard sized deck if you play all three, likely putting what you need into your hand through sheer force of numbers. You can also think of it as a magic potion, putting yourself back into safe levels after a bad hit of damage, with the added bonus that you might draw into some burst economy to keep your momentum going. Against corps like Jinteki, who buy time with money and damage against the runner, a spare diesel can allow you to barely stop for breath. The most important part of Diesel is that it's free. It's hard to beat a free 3 cards, using only 1 card and a click. Essentially, it turns a two-click double-draw into a one-click double draw. It's difficult to imagine a scenario in which this is bad. Perhaps it makes it harder to decide whether to mulligan. On the other hand, it helps draw out of a bad or mediocre hand (or make a good hand better.) 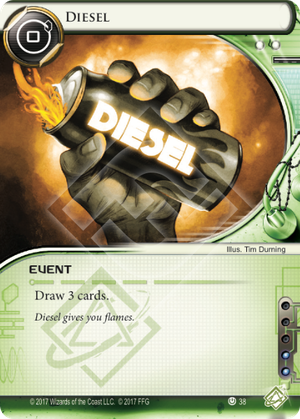 If you plan on ever drawing cards, Diesel is fantastic. It even serves to thin your deck. In Shaper decks, it's pretty much an auto-include. In Anarch or Criminal decks, it may be worth it depending on how you need to spend your influence. Otherwise, pretty much every deck should run this. Some might compare this to Anonymous Tip. However, drawing cards as a corp is different than drawing cards as a runner. As a corp, it's dangerous, since you're increasing the number of agendas available for the runner to access. You're even getting closer to drawing out your deck. With a forced draw each turn, often you would rather not draw another card. A runner has no such limitations. Others might compare it to Ancestral Recall from Magic: The Gathering. In Magic, it costs 1 mana, in Netrunner it costs 1 click. Ancestral Recall is considered one of the top 9 most powerful cards in the game, if that gives you an idea of how strong it is. Netrunner may be a different game, and clicks are definitely not mana, but free cards are free cards.